Description of "Vayupaan Kriya (Madhumeh Unmoolan Vishesh)"
Drink Air Therapy is an ancient practice for Self-Realization. This book is written for preparing common mass to embrace a very simple but powerful self-help mechanism of drinking air(not breathing air) to eradicate Diabetes(both Type 1 and 2) from root and foster longevity with healthy body and mind. Ancient Kriya Yoga Mission is engaged in disseminating simple techniques of ancient science of living. These simple techniques are meant to be practiced by anyone without any external assistance and guidance. This body is just an instrument of meditation and the individual is nothing, the individual have nothing. 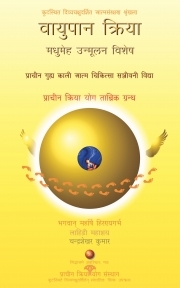 This book is dedicated to all Sadhakas. Chandra Shekhar Kumar is a direct disciple of Lord Maharishi Hiranyagarbha. He is the CEO and Co-Founder of Ancient Kriya Yoga Mission. He is the CTO and Co-Founder of Ancient Science Publishers. He holds a degree of Integrated M.Sc. (5 yrs) in Physics from IIT Kanpur. Lahiri Mahasaya is a direct disciple of Mahavatar Babaji who is a direct disciple of Lord Maharishi Hiranyagarbha. Reviews of "Vayupaan Kriya (Madhumeh Unmoolan Vishesh)"